Honeybees are a species of sapient bees that appear in Super Mario Galaxy and Super Mario Galaxy 2. They are roughly the same size as Mario, and often talk to him as he explores the galaxies they inhabit. The Honey Queen acts as their ruler. 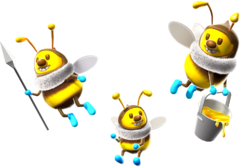 In their first appearance in Super Mario Galaxy, Honeybees appear primarily in Honeyhive Galaxy, Honeyclimb Galaxy, and Gold Leaf Galaxy. In addition, the Bee Mushroom makes its first appearance in this game, which allows Mario to transform into Bee Mario. In this form, Mario is able to flutter through the air for a brief period of time, and also stick to and climb Honeycomb Walls. Honeybees reappear in a few galaxies in Super Mario Galaxy 2, serving the same function that they did in Super Mario Galaxy. Occasionally, they give the player helpful tips on how best to control Mario after he transforms into Bee Mario. After completing the "The Secret Wall Jump" mission in the Honeybloom Galaxy, a Honeybee appears onboard Starship Mario, and tells the player that they can flutter higher in the air if they collect coins while hovering as Bee Mario. When the Honeybee boards Starship Mario, Lubba says he is allergic to bees. Honeybees also appear in the Honeyhop Galaxy, and Honey Queen makes a reappearance. This page was last edited on April 21, 2019, at 13:22.